Now you know the most important things about Zanzibar itself, I thought it’s about time to write a little about my life here. Firstly, I live in Stone Town (see aerial shot below), a UNESCO World Heritage site. It’s a very old town full of narrow winding streets that make it exceedingly easy to get lost. The locals are used to tourists and so will try to sell you the infamous “Jambo Jambo” CD, football shirts or spices until they realise you live and work here a few weeks later. As a tourist destination, Stone Town is very liveable when compared to other ODI placements (c.f. Juba!) with relatively varied cuisine and potential for fun day trips. I’m fortunate to be joined on the island by a collection of great friends. They are here for varied reasons: there are the other ODI Fellows, UN Volunteers and other development-based workers, some are volunteers, some run NGOs, others run businesses in tourism and some are students. All are very welcoming as we are used to new friends arriving and old friends departing with sometimes scary regularity. And so to the reason I’m here: to work. I’m an economist in the President’s Office: Planning Commission of Zanzibar in the Department of National Planning, Poverty Reduction and Sectoral Development. The Planning Commission (PC) was split off from the Ministry of Finance a few months ago but still works closely with it. The point of the PC as I see it is to try to coordinate the relationship between many of the programmes and projects set up by the government and donors and the five-year national plan (MKUZA II). For my department, this means looking at lots of concept notes/project proposals and making sure they make sense and align with wider objectives as well as looking at how to monitor and evaluate progress. My role is varied and gives me scope to learn about all sectors of the economy from finance to agriculture to future offshore fossil fuel extraction. The work can be very stop-start and patience is a virtue. However, almost three months in, things are picking up with the acceleration of the budget cycle (up to June). Another factor is that I’m becoming more useful as I pick up more Swahili and understand more about what is going on around me. A quick word about Christmas (yes, it was only a few weeks ago). This was my first Christmas away from home in Cornwall so it was rather strange. I was not bombarded by festive music and advertising everywhere I looked. I didn’t eat turkey and brussel sprouts. And, for the first time in my 25 years, I did not have a stocking at the end of my bed on Christmas morning (it was probably about time for that to end anyway). However, the traditions that we recreated on the island became more precious because they were intentional and took more effort. Special moments included some friends hiring a cinema for watch Elf and the Nightmare Before Christmas, drinking mulled wine and singing carols at a party and having a breakfast of smoked salmon and bucks fizz on Christmas morning before watching Die Hard 2. 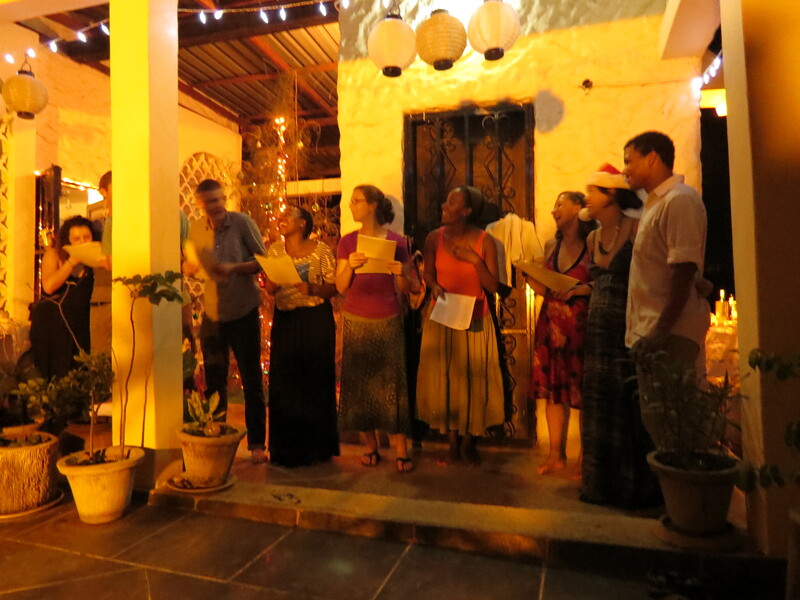 Singing carols with friends and occasionally attempting harmonies. Top marks to Nell for hosting a great party with Rich and nailing the descant to Hark the Herald. On a different note, I was thrilled to have my most reliable Skype session to date with my family (with all Grandparents) for more than an hour and see the opening their presents from me. I’m looking forward to seeing them and as many friends as possible when I come back to the UK for a couple of weeks around Easter. So there you have the basics of what I’m doing in Zanzibar. Please get in touch if you have any questions and I’ll resolve to answer them in future posts.